A new research report of Persistence Market Research (PMR) delivers valuable intelligence on the global rare endocrine disease treatment market by providing an all-inclusive forecast on the market growth between the period 2017 and 2026. Addressing key concerns of drug makers for rare endocrine disease treatment, and reflecting impact of latest industry trends on demand for rare endocrine disease treatment, the report imparts precise analysis & forecast on the global rare endocrine disease treatment market. This report also acts as a credible business document for companies partaking in the rare endocrine disease treatment market globally. This research report contains an array of distinct chapters, which provide a detailed segmentation of the global rare endocrine disease treatment market, encompassing various aspects driving the market expansion. Research findings from the report depict potential for consumer base expansion and enhancing exposure of rare endocrine disease treatment across various industrial sectors worldwide. Impact of transforming directives related to formulation, transportation and storage of rare endocrine disease treatment has been directed toward estimating advancements in rare endocrine disease treatment in the foreseeable future. Technology trends, and industrial regulations have been unveiled by the report for increasing lucrativeness of rare endocrine disease treatment. Referring to insights offered in this report, drug makers of rare endocrine disease treatment can formulate methods for expanding their businesses globally beyond conventional margins. 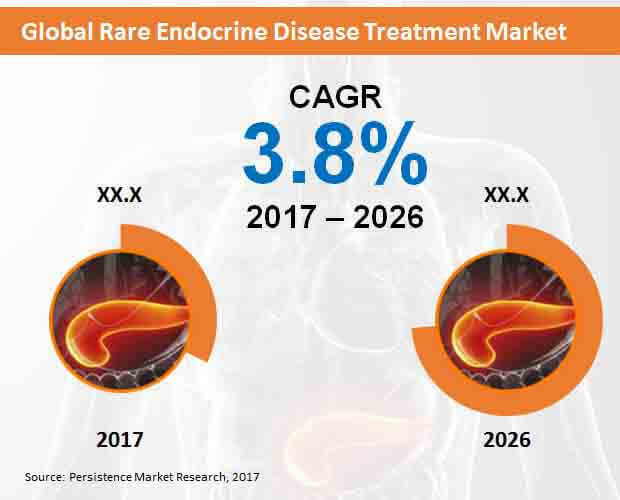 As the identification of untapped opportunities in the global rare endocrine disease treatment market has prevailed as a major challenge for the market participants, this report offers analysis that discloses these opportunities. Intelligence provided in the report will enable companies developing treatment options for rare endocrine disease in making modified decisions for profitable and long-term business expansion. Considering the lucrativeness of rare endocrine disease treatment and its fluctuating cost, data points have been rendered in the report, with which the market players will be able to minimize risks. Offering in-depth insights on regions and countries lucrative for the market growth, companies are enabled to re-strategize their global measures. Continuous discussions with leading industry experts along with references of authentic databases are key methods employed by PMR’s analysts for harnessing baseline information to forecast the market size. Data obtained has been collated for creating a framework on demand evolution of rare endocrine disease treatment in the upcoming years. A tested & proven research methodology has been employed by the analysts for projecting growth prospects of the global market for rare endocrine disease treatment across multiple market parameters. Quantitative data has been combined with qualitative information in a bid to enhance accuracy of the market size evaluations forecast. Leading companies in global rare endocrine disease treatment market are profiled in the report’s concluding chapter. Companies can avail this report for assessing their current market standing, and understanding opportunities for enhancing their reputation. Supply chain complexities, formulation challenges, and pricing volatility are addressed and analyzed in this chapter for resolving key concerns of the market players. Competition landscape analysis issued in this chapter is priceless for emerging market players. Novel strategies employed by the market leaders are disclosed in this chapter, which provides the first-hand information on establishment strategies that can be leveraged by niche companies partaking in the global rare endocrine disease treatment market. Obesity, a pandemic ailment, has been largely associated by medical scientists with several endocrine diseases, which include common (polycystic ovarian syndrome, and hypothyroidism) and rare (hypothalamic disorders, and Cushing’s syndrome) counterparts. Mechanisms for developing obesity vary in accordance with the endocrine condition. In case of rare endocrine diseases, interaction with growth hormones and thyroid plays a pivotal role, in tandem with increased adipogenesis and adipocyte differentiation. Appropriate evaluation of treatment plan related to obesity-related rare endocrine diseases are being carried out by researchers, with overweight patients being the top priority. For example, researchers from the University of Newcastle are working on evaluation of natural history related to the development of obesity, considering the aetiological factors. Although, complete evaluation has not yet been attained, these researcher perceive laboratory testing and physical examination to extend the evaluation for excluding common endocrine causes. Results then obtained would enable selection of an appropriate treatment plan. A recently composed research study of Persistence Market Research (PMR) foresees a moderate growth for the global rare endocrine disease treatment market over the period of forecast, 2017 to 2026. Revenues from treatment of rare endocrine diseases are envisaged to reach approximately US$ 12,000 Mn by 2026-end. Rarity of endocrine diseases entails challenges for researchers and clinicians in gathering sufficient qualitative & quantitative patient data, in order to support statistically powerful clinical trials. With the provision of secure online access to analytical tools and extensive data sets, endocrine genomics virtual laboratory (endoVL) enables researchers to work together for breaking ground on diagnosis and treatment of rare endocrine diseases. More than 8,500 adrenal tumor cases are registered on endoVL currently, which in turn allows researchers to bank on large cohorts for conduction analyses with real statistical power. Over 25 large-scale clinical trials are being run currently under endoVL, which involve research groups from across the globe. This research collaboration, dedicated toward development of effective treatment options regarding rare endocrine diseases, will pave new growth opportunities for the global rare endocrine disease treatment market. Disorders of endocrine system generally manifest in multi-organ fashion, initially becoming apparent in the eye via various distinct pathophysiologic disturbances. Some of the common manifestations of rare endocrine disorders in the eye include septo-optic dysplasia, multiple endocrine neoplasia, and Wolfram syndrome. Recognition of ophthalmic manifestations of rare endocrine diseases is critical for rapid diagnosis and treatment, as well as preventing significant mortality and morbidity. For biotechnological and pharmaceutical companies, as well as medical researchers, ophthalmic manifestations of rare endocrine diseases are expected to be an attractive space for bringing treatment developments and innovations. PMR’s report has identified and tracked key companies contributing to developments in rare endocrine disease treatment, which include Novartis, Ipsen, Pfizer, Inc., Teva, EMD Serono, Novo Nordisk, Eli Lilly, Shire, Amgen, Inc., Corcept Therapeutics, and Novelion Therapeutics. Spruce Biosciences, a clinical-stage biotechnology industry, has been developing novel therapies apropos rare endocrine diseases. The company recently received an orphan drug designation by the FDA for its SPR001, which is being considered effective for treatment of a rare endocrine disease, congenital adrenal hyperplasia (CAH).